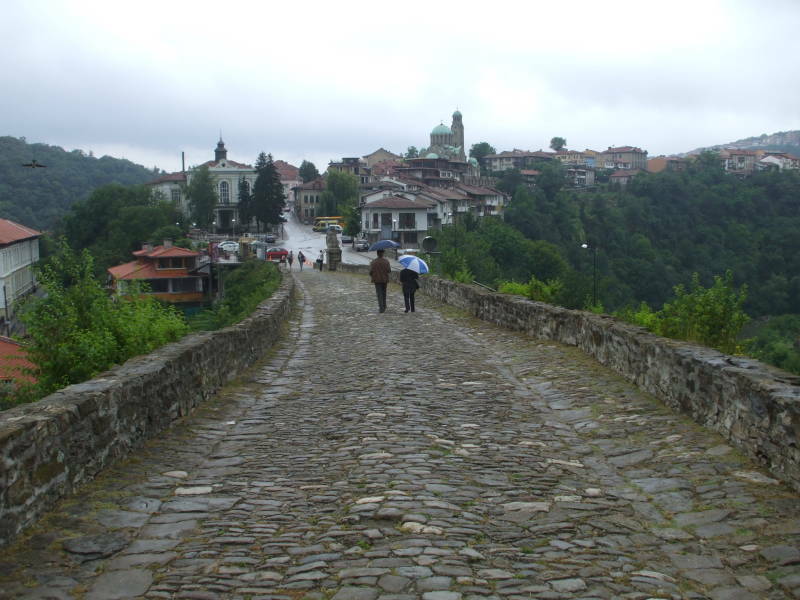 Our destination is Велико Търново or Veliko Tarnovo, the seat of the Bulgarian Empire and the heart of Bulgarian culture. It's a small city in a steep valley along the twisting Yantra river. This is part of the Athens to Paris by Train series, start at the beginning to get the background and the details so far. We arrived here by train from Sofia. In red: The rail route from Sofia to Veliko Tarnovo. The city's name gets transliterated into the Roman alphabet in a variety of ways. 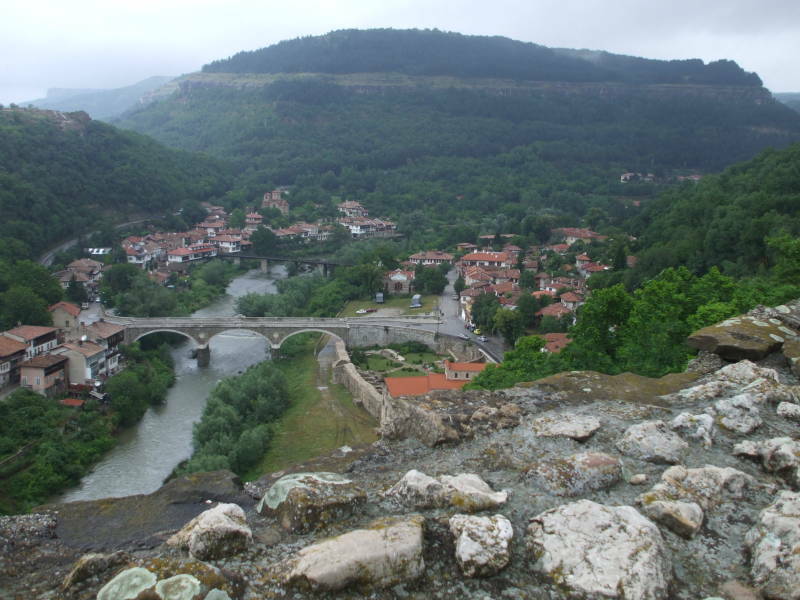 Велико or Veliko means Great, but shall we spell the city's original name as Tarnovo, Târnovo, Turnovo, or Tŭrnovo? 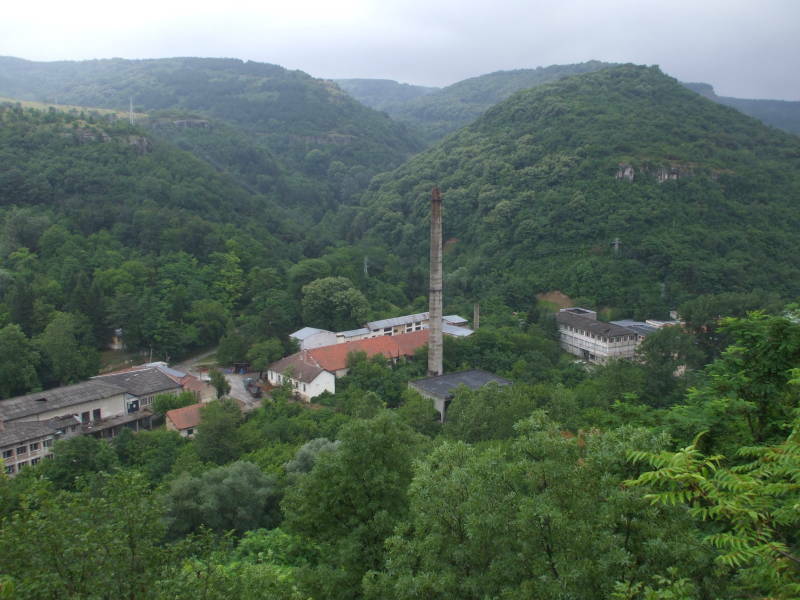 You will see all of them, I will stick with the fairly common Tarnovo. In Russian, the character Ъ or yer is the твёрдый знак, the tvyordiy znak or "hard sign". It affects the pronunciation of the preceding consonant but it doesn't have a sound of its own. And with the spelling reforms that followed the Revolution of 1917, poor Ъ was dropped from its previous role as the end of every word that didn't need Ь, мягкий знак, myagkiy znak or the "soft sign". However, the letter Ъ functions as a vowel in Bulgarian. It is pronounced like the a in ago or the u in turn. It even appears as the second character in the name of the country and the language! Or at least that's the spelling of the current nation and language. This area has been populated for a long time. Humans settled here in what is today's Bulgaria in 44,000 BC. Just south of Veliko Tarnovo, in Stara Zagora, archaeologists have found Neolithic era dwellings dating back to 6,000 BC. Complex societies were established by 5,000 BC, producing some of the world's first first pottery and jewelery. Later, the Bronze Age Ezero culture established some of the earliest grape cultivation and livestock domestication. The Thracians appeared on the Balkan peninsula after 3,000 BC, arriving from, well, it isn't clear just where they came from. They had an advanced culture despite not having their own proper script and being generally disorganized. Their divided tribes managed to form powerful military forces when they had to due to threats from outside. They finally became united in the 400s BC, and then were incorporated into the Macedonian Empire and became part of Alexander the Great's expeditions. The Bulgars were a semi-nomadic Turkic people from Central Asia who had lived on the steppes and along the Volga River from the 2nd century AD. They were Central Asian enough to style their hereditary leader as Khan. In 632 AD Khan Kubrat had unified three major Bulgarian tribes into Onoguria, now called Great Bulgaria. The Bulgars had been moving westward, Great Bulgaria wrapped around the north of the Sea of Azov and the Black Sea to the lower Danube River. Byzantine Emperor Heracluis signed a peace treaty with Khan Kubrat in 635, extending Bulgarian control into the Balkans. Some of the Bulgars who stayed behind created the Kingdom of the Volga Bulgars. They had a monopoly over trade between the Arabs, Norse, and Avars, and were the first force ever to defeat the Mongols. They thereby protected Europe for many decades, but eventually the Mongols destroyed their kingdom and killed or enslaved most of the population. Meanwhile, the First Bulgarian Empire was growing. It came to include all of today's Bulgaria, Romania, Macedonia, Albania, Bosnia, Herzegovina, Serbia and Croatia. The Bulgarians officially became Christians under Boris I with his conversion in 865. The Ecumenical Patriarch in Constantinople set up an autonomous Bulgarian Archbishop. Cyril and Methodius, missionaries from Constantinople, knew the Old Slavonic language from their childhood in Thessaloniki. They developed the Glagolithic alphabet, which the Bulgarian Empire adopted around 886. The Cyrillic alphabet was developed from Glagolithic soon after that. Its development is attributed to Saint Clement of Ohrid, a follower of Cyril and Methodius. Not all of the resulting letters have lasted until today, see the purple Cyrillic letters plus Ѧ in this table. These brothers reappear throughout this trip, especially in the Bucovina region around Gura Humorului in north-eastern Romania, and in Prague, where they are the subject of the highlight stained glass window in the main cathedral. Bulgaria eventually grew to threaten the Byzantine Empire. The Byzantine Emperor Basil II began a war to conquer Bulgaria in 986, finally capturing the last Bulgarian strongholds in 1018 and establishing Byzantine rule of Bulgaria. The Byzantines guaranteed that Bulgaria would not be divided, preserved the Bulgarian nobility, and recognized the autocephaly of the Bulgarian Orthodox Church. This treatment avoided major resistance and uprisings. Peter and Asen led a revolt against Byzantine rule in 1185, and Peter declared himself Tsar Peter II, "Tsar of the Bulgars, Greeks and Wallachians". The Byzantine Empire recognized Bulgaria's independence and control over Wallachia and Moldova, today's Romania. This Second Bulgarian Empire was ruled from Tarnovo. The Bulgarian Orthodox Patriarchate was restored in 1235, and relations were opened with the Roman Catholic west, especially the trading city-states of Venice and Genoa. 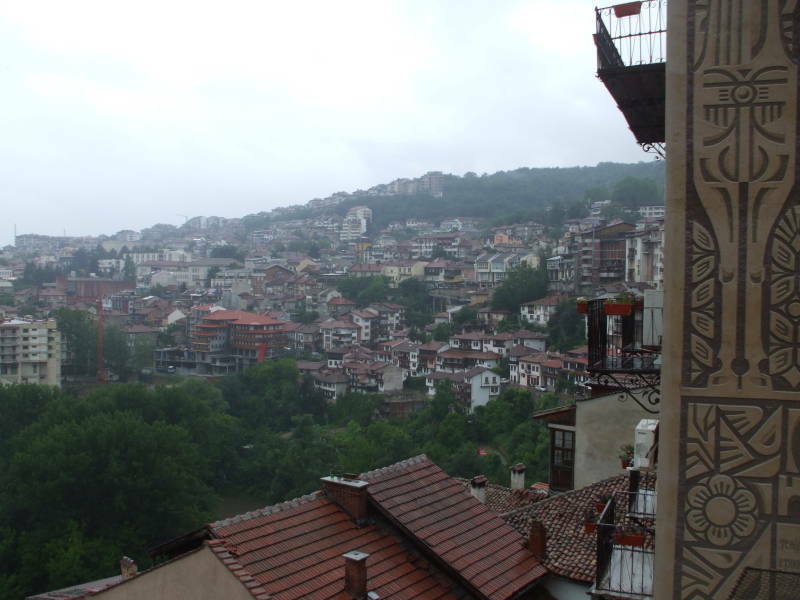 Tarnovo became a "Third Rome", a major economic and religious center, while the "Second Rome", Constantinople, was already in decline. Then the Ottoman Turks showed up. They moved around Constantinople (which they eventually captured in 1453), entering Europe in 1354. They captured more and more of the Balkan peninsula, occupying Tarnovo after a three-month siege in 1393. This began the long Ottoman rule of Bulgaria. Ottoman power declined beginning in the 17th century and was quite weak by the end of the 18th century. The Greeks tried to revolt against Ottoman power, but they got little help from the Bulgarians. The Greeks had served as administrators for the Ottomans, and their heavy suppression of the Bulgarian Orthodox Church and Bulgarian culture had led — to Greek surprise — to resentment from the Bulgarians. The Bulgarians launched their highly disorganized April Uprising in 1876. It was crushed by the Ottomans, who massacred tens of thousands of people. The reaction in western Europe to the "Bulgarian Horrors" led to the Russo-Ottoman War starting in April 1877. By January 1878 Russian forces had liberated much of Bulgaria. 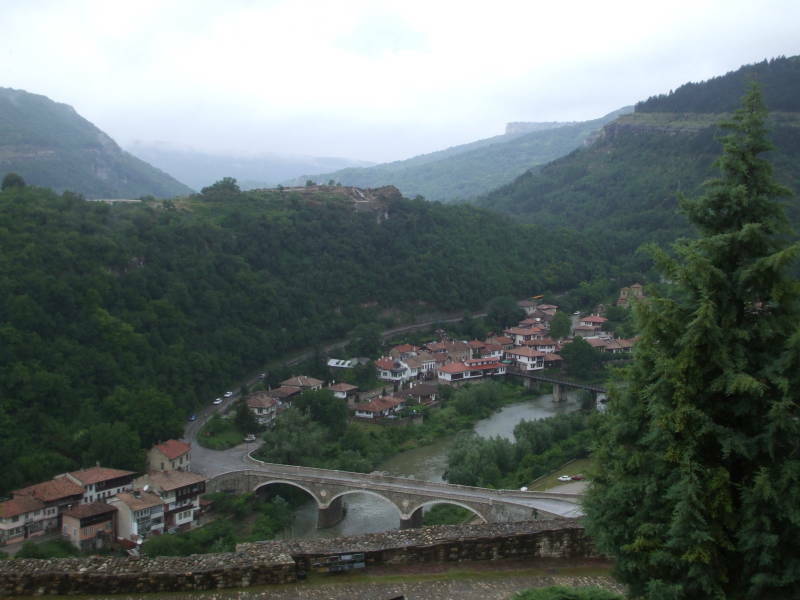 The Principality of Bulgaria was established on March 3rd, 1878, with its capital at Tarnovo. The borders shifted with the late 19th century Balkan Wars, World War I and the end of the Ottoman Empire. 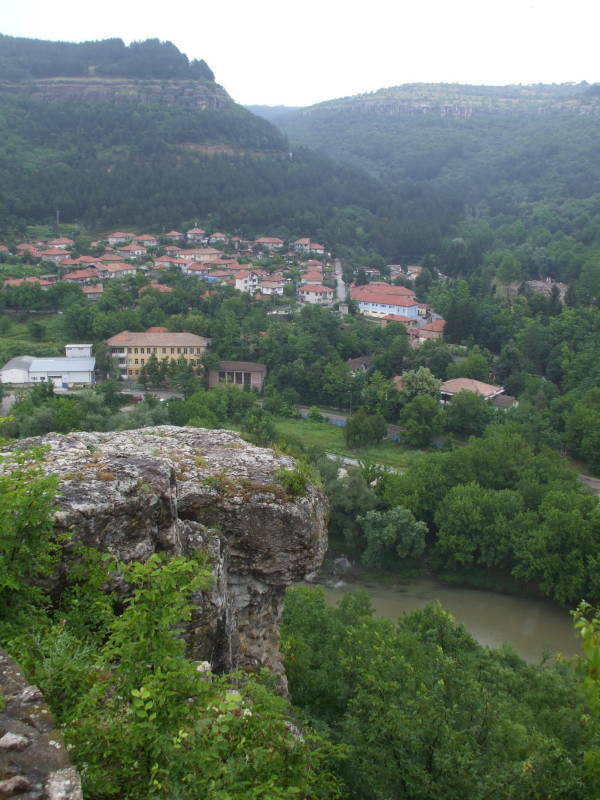 The city's name was changed to Veliko Tarnovo, or Great Tarnovo, in 1965. The railway hub on the Sofia-Varna and İstanbul-Bucureşti main lines is north of the city of Gorna Oryakhovitsa. 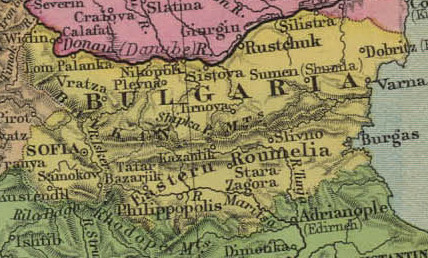 Map of Bulgaria from Stanford's atlas of 1899. 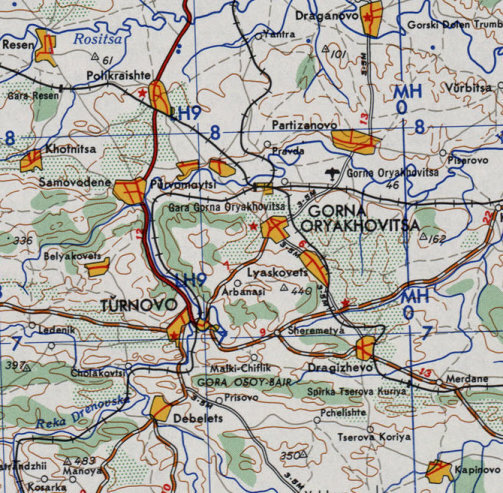 See Tirnovo just below the G in "Bulgaria". 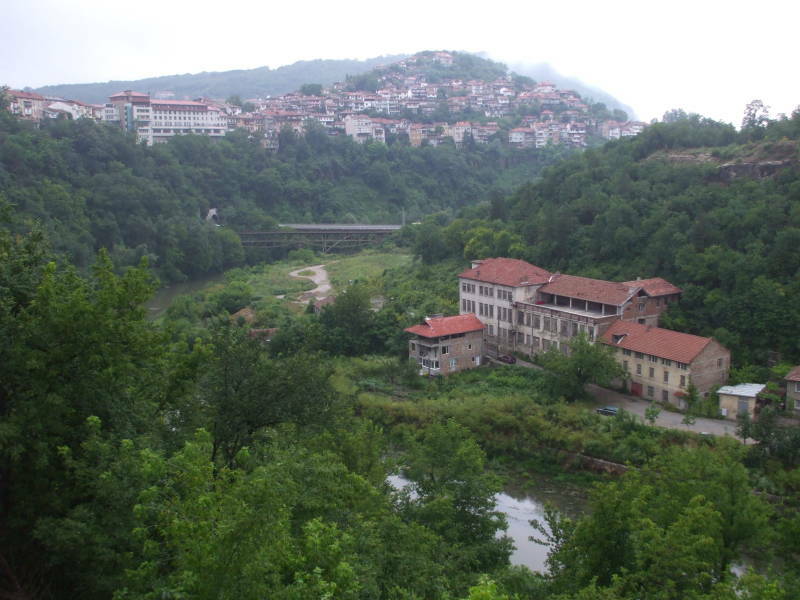 Veliko Tarnovo is a smaller city. Because of its historical and cultural significance, it may be included on maps well before other cities of the same population, but you have to get to a pretty detailed map before it shows up. The nearby Gorna Oryakhovitsa, a major rail hub, is much more likely to appear. Or at least that's the case with current maps. Older maps are more likely to include it. The map above is from 1899, when the territory to the south was still controlled by the Ottoman Empire. As you can see from the maps, the Sofia-Varna main rail line runs west to east across relatively flat and open terrain. It runs along the southern edge of the rich farmland belt across much of the northern third of Bulgaria. 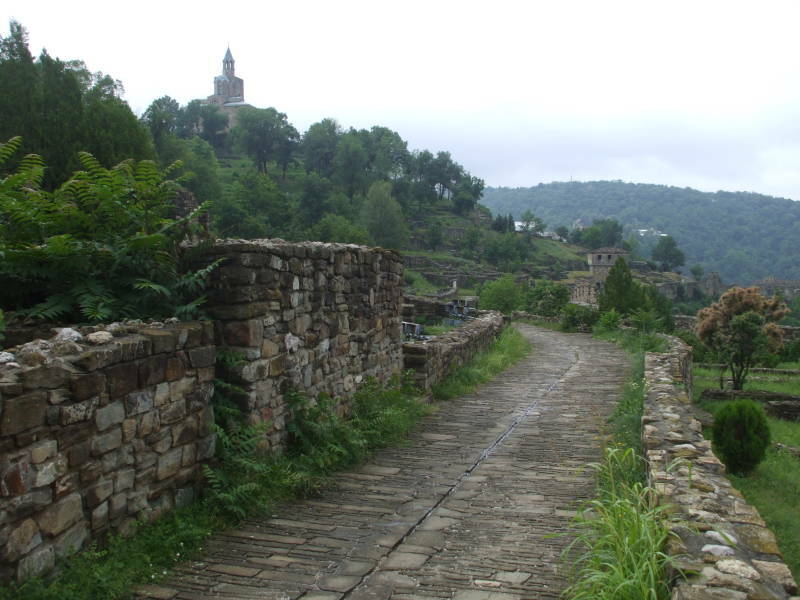 Veliko Tarnovo is in the curving valley of the Yantra river. The high land around it is fairly flat, like a plateau cut by river valleys. The land gets more rugged to the south, leading to the Balkan Mountains running west to east across the central third of Bulgaria. Like I said, the city is built in a steep valley along a twisting river. This makes it difficult to run rail lines, which are limited as the radii of turns and steepness of grades. In the first picture you see a bridge coming out the side of a hill. The rail line just punches straight through, going from bridge to tunnel to bridge to tunnel just north of the city's station. In the second picture we are looking roughly north down the river valley in the direction of Gorna Oryakhovitsa. 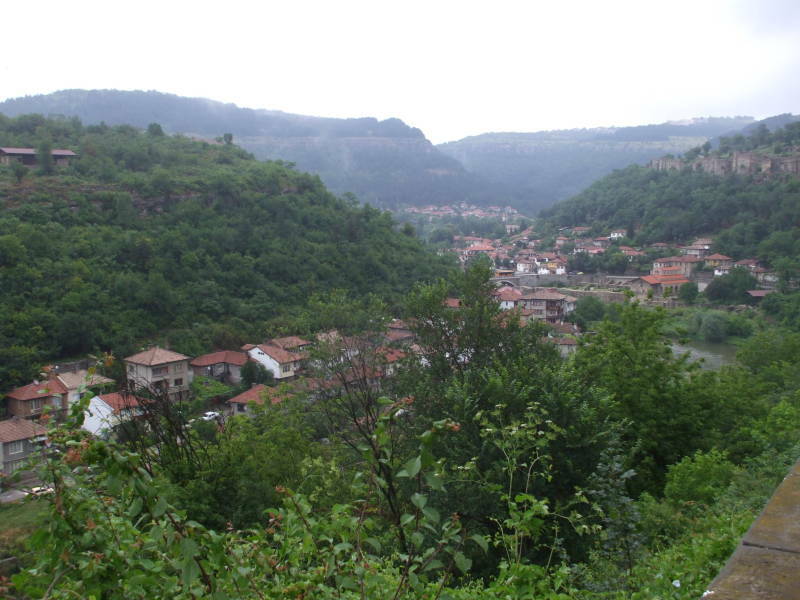 The road between Veliko Tarnovo and Gorna Oryakhovitsa follows the river, curving along the valley slope. 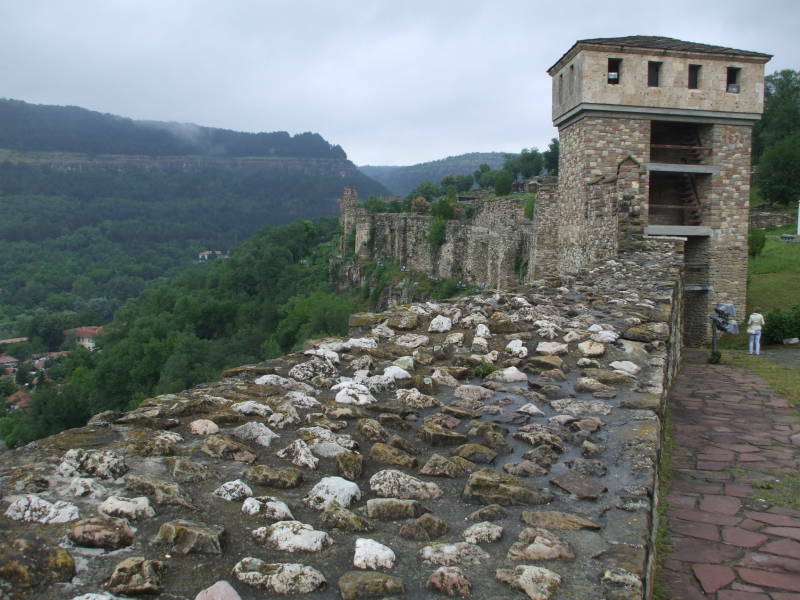 Царевец or Tsarevets was the primary fortress of the Second Bulgarian Empire from 1185 to 1393. It is located on a hill at the east end of the city. The hill is almost completely encircled by the Yantra river. The river comes within about 200 meters of making the hill an island. In this picture we are looking at the one approach to the hilltop fortress, along the narrow ridge connecting it to the rest of the city. Sturdy walls surround the hilltop fortress. Steep slopes below those walls lead down to the river. The hilltop was settled back in the 2nd millennium BC. A Byzantine city, apparently Zikideva, was built here in the late 400s AD. 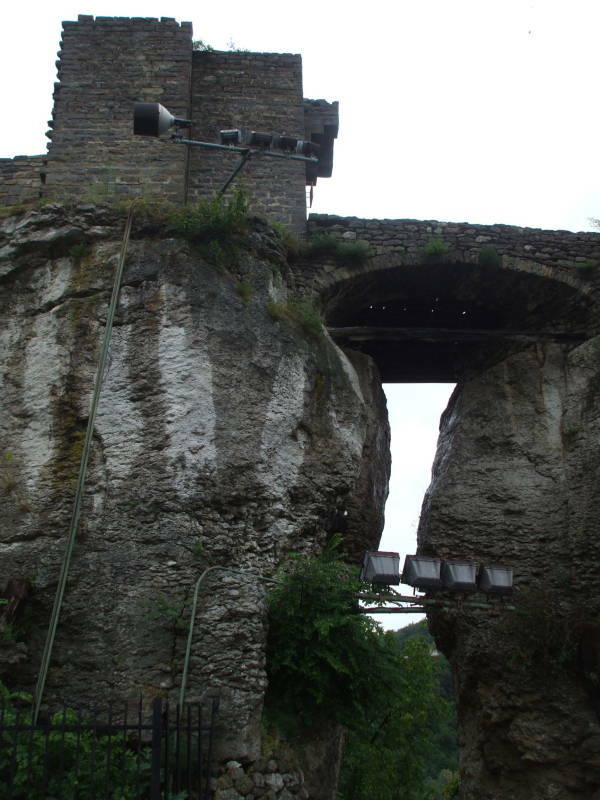 Construction of the fortress began in the 1100s. Archaeologists have identified remains of 400 residential buildings, many craftsmen's buildings, at least 22 churches and four monasteries. The Ottomans required a three-month siege to capture the fortress in 1393. 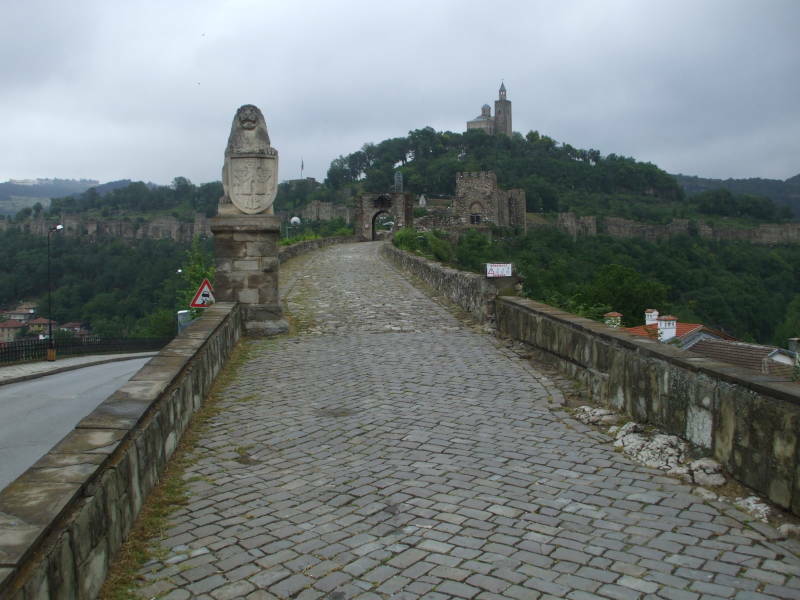 The main entrance is along a narrow roadway on the steep ridge connecting to the fortress. Along the way you must cross the drawbridge seen here and then pass through two heavy gates. A third gate existed back in the day. You have dramatic views once you get inside the fortress. This is Execution Rock, an outcropping where traitors were executed by being pushed off. The tradition is that their bodies would fall into the Yantra river. The Patriarch Joachim III was executed here by Tsar Theodore Svetoslav in 1300. The Synod would nominate three candidates for the Patriarchy and the Tsar would approve one of them, expecting them to support all the state policies. Somehow Joachim III didn't follow the rules and he was convicted of high treason. Today's view from the rock shows that it was a long drop. But one push into the river? Even the most energetic of pushes would fail to get them to the river, even during the most severe floods. Maybe a running start was required? The peak of the Tsarevets hill holds the Patriarchal Cathedral of the Holy Ascension of God, or Патриаршеска катедрала "Свето Възнесение Господне". This was the seat of the Bulgarian Orthodox Church during the Second Bulgarian Empire. It was built on top of a late Roman or early Byzantine basilica from the 5th-6th century AD. Meanwhile the Bulgars had arrived following a polytheistic religion centered on Tengriism, the worship of the sky deity Tengri and reverence for the sky in general, mixed with shamanism, animism, totemism, and ancestor worship. The old church might have been in light use after the conversion of Boris I and, officially at any rate, the nation, to Christianity. But it wasn't much in comparison to what was built during the time this was the imperial capital. The first stage of the construction of this cathedral was done in the late 11th or early 12th century. It was initially the monastery church at the center of a monastery compound, but it had become the seat of the Bulgarian patriarchate by the early 12th century. It was then rebuilt in the mid-14th century after a devastating fire. That second stage of construction also added the exonarthex and bell tower. It was a fortress within a fortress, standing in the center of the courtyard within the walled monastic compound with two defensive towers. The cathedral was mentioned in a number of medieval sources. One of the earliest described the transfer of the relics of Saint Michael the Warrior to the cathedral on the order of Tsar Kaloyan, who ruled 1197-1207. 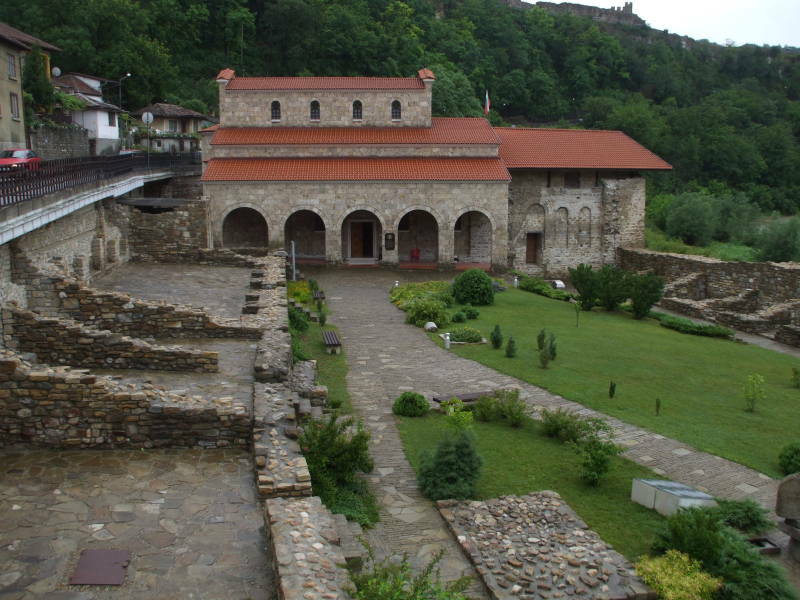 In the late 14th century the last Patriarch of Tarnovo (spoiler alert), Saint Evtimiy, referred to it in his writings as the "great patriarch's Cathedral of the Holy Ascension." The cathedral was destroyed along with everything else in the fortress when the Ottomans captured it in 1393. It was fully reconstructed in 1978-1981, which you will note was during the communist rule of Bulgaria. 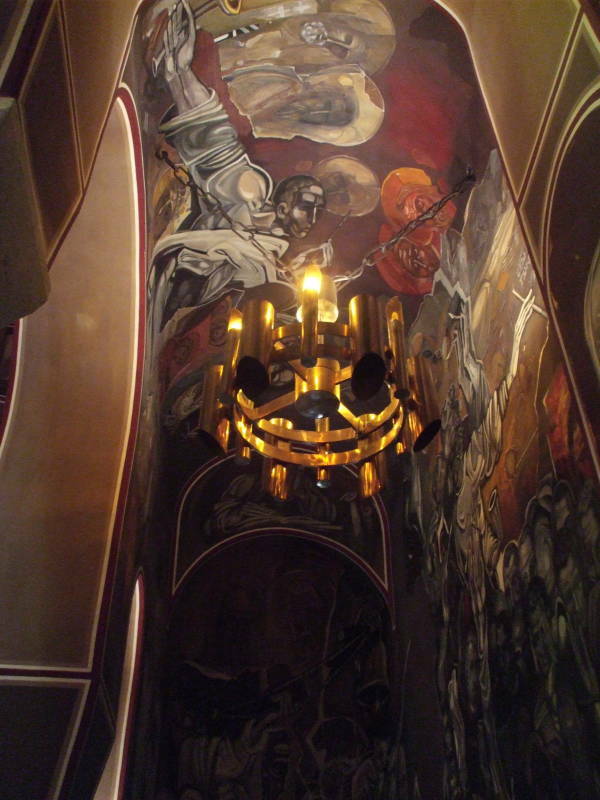 The interior is decorated with strikingly modern murals depicting a mixture of traditional religious figures and historic figures and events from the history of Bulgaria. 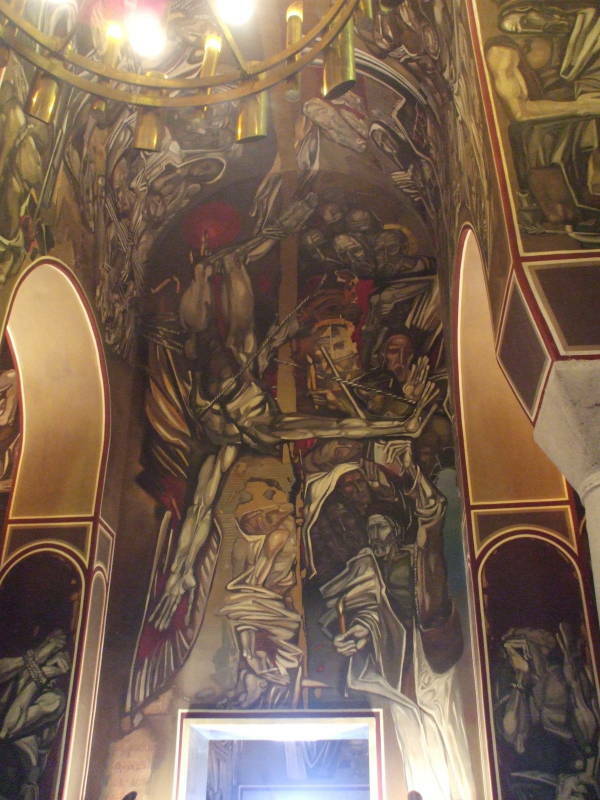 The cathedral was re-opened to the public in 1985 when the murals had been completed. 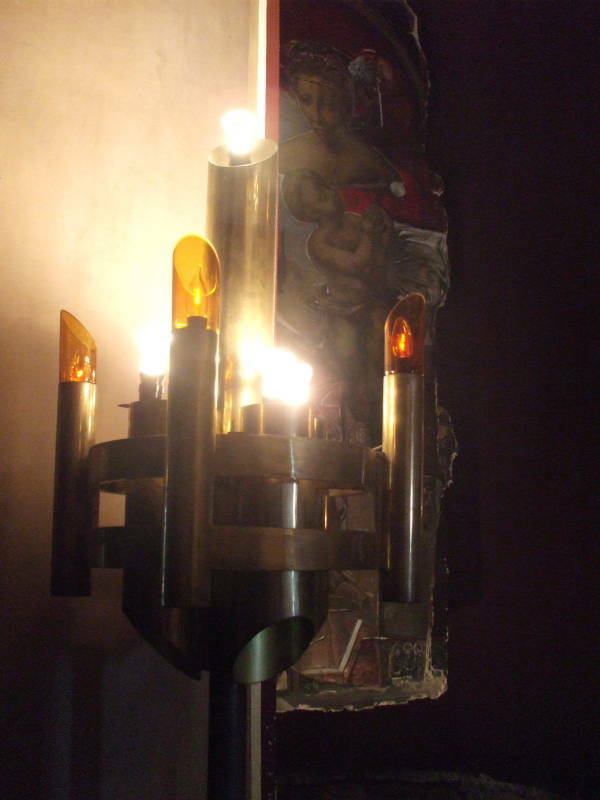 It is built in the classic Byzantine cross-in-square design, with three semidomed apses. Some of the art looks like something Salvador Dali would have done, or at least appreciated. There is something about this combination of highly polished metal and colored glass that says "Slavic" to me. I saw so much extruded aluminum and gold to brown glass in Russia. The exonarthex, the outermost enclosed space of the cathedral, contains a number of tombs from the 14th century. 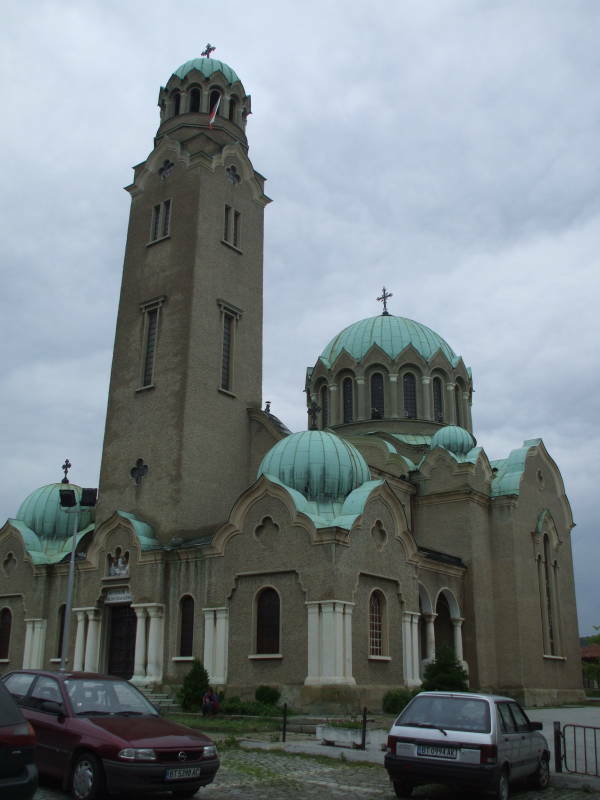 In addition to the relics of Saint Michael the Warrior, the cathedral houses the tombs of the Bulgarian patriarchs Joachim I, Macarius, and Joachim III. Joachim III was pushed off Execution Rock. So it appears that someone was sent down the hill to retrieve his body for burial in the cathedral. Let's go down the hill ourselves. Not the steep part, just this path and series of staircases. As you can see, we have ascended quite a ways to get to the Patriarchal Cathedral. 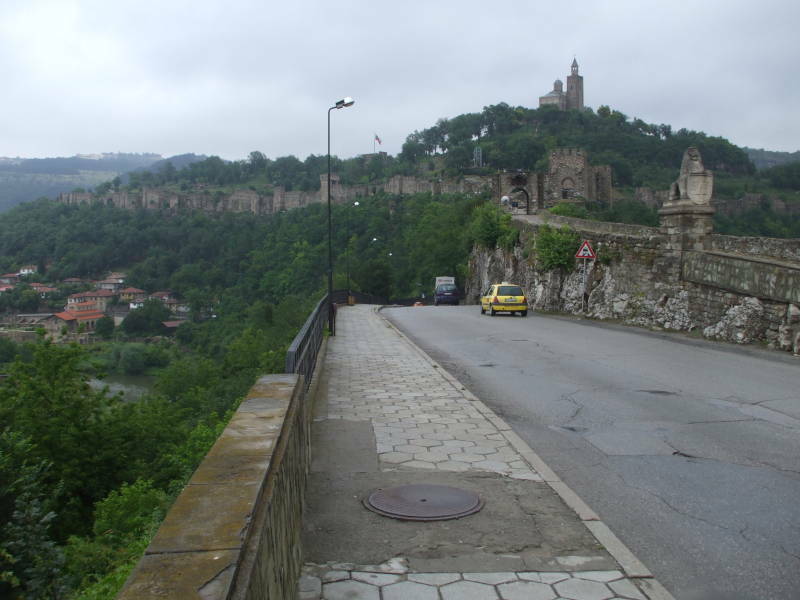 We will go down to the gates, across the entry road, and up into central Veliko Tarnovo. There is a sound and light show every night. Colored flood lights, three powerful lasers including an impressive green argon one, and booming narration and sound effects enact the history of the fortress. The Communist regime that controlled Bulgaria from 1944 until 1989 worked to control the church, and thus the people, rather than destroy it outright. But the first five years or so were the worst. In 1944-1947 the Communist government removed church history and catechism from schools, and took over the control of marriage, divorce, and the issuing of birth and death certificates. There was anti-religious propaganda and some persecution of the clergy. Things were worse in 1947-1949, when the government executed Bishop Boris, imprisoned the administrator of the Rila Monastery, and murdered a number of other clergy and charged others with crimes against the state. After that especially dark time, things were less bad through the rest of the years of communism. The church, now intimidated and clearly aware of the limits of its freedom, got along with the government. And as long as the church was cooperative, the government did not imprison or murder clergy. The Yantra river winds through several long loops as it makes its way through and around Veliko Tarnovo on its way north to eventually empty into the Danube. 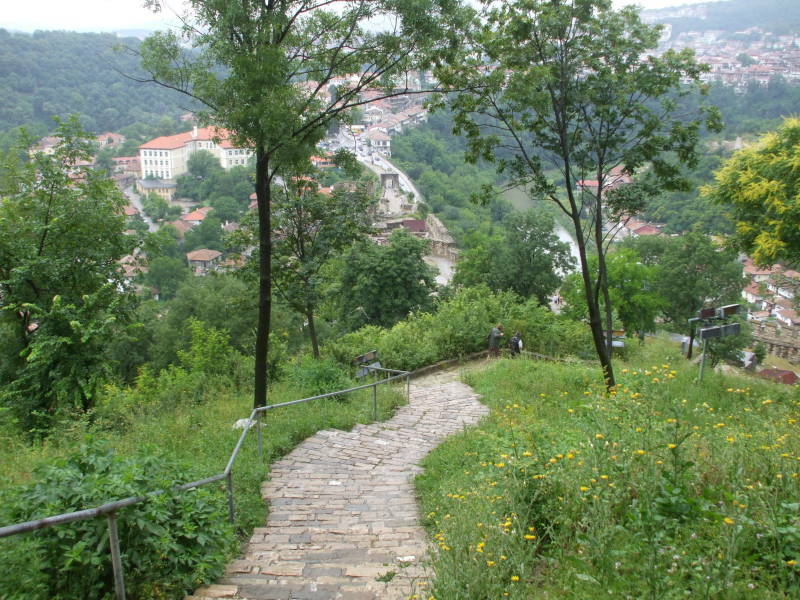 Here we are looking east from close to the city center, over the Yantra to Tsarevets. We are on Sveta Gora, the Holy Hill, and the third hill of the old city is across the river to our right, Trapezitsa with its trapezoidally shaped old fortress. 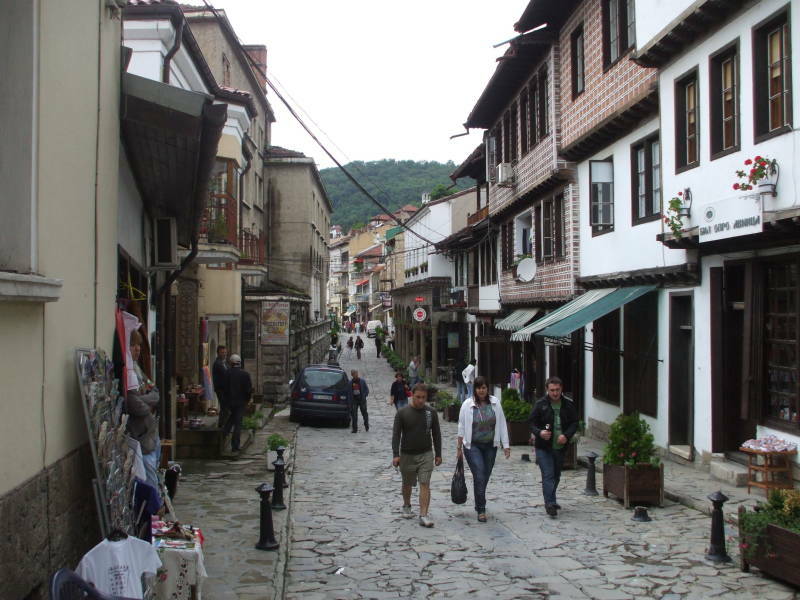 Tarnovo was one of the main centers of culture in medieval Europe, making significant contributions in architecture, art, and literature. 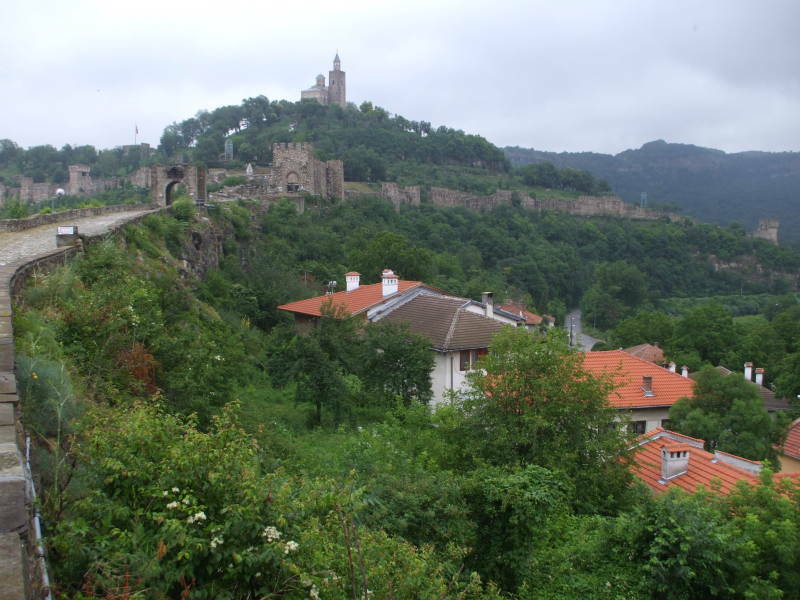 It had twelve to fifteen thousand inhabitants in the 14th century, when Tarnovo claimed to be the Third Rome. It is still a cultural center and home to the largest Bulgarian university outside Sofia, the Saint Cyril and Saint Methodius University of Veliko Tarnovo. Over 12,000 students are enrolled in the nine faculties and colleges of Economics, Education, Fine Arts, History, Law, Modern Languages, Orthodox Theology, Philosophy, and Mathematics and Informatics. The Cathedral of the Birth of the Theotokos was completed in 1844 and reconstructed in 1913. By Bulgarian standards, it's quite new. Theotokos is a Greek term meaning "God-Bearer", this cathedral is dedicated to the birth of the Virgin Mary. Bulgarians actually say Богородица or Bogoroditsa to express the "God-Bearer" concept. 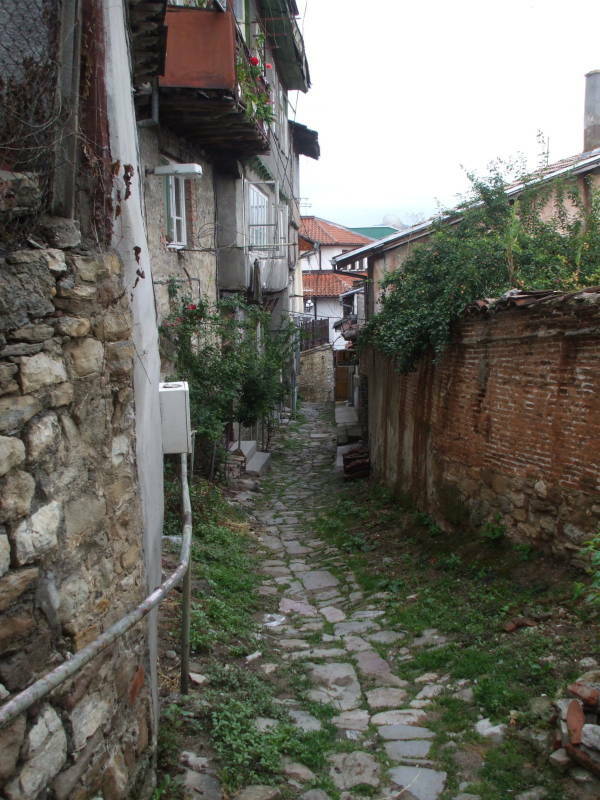 This street goes through the old Varosha district in Tarnovo. This was a cosmopolitan city during the Second Bulgarian Empire, with foreign envoys and Armenian, Jewish, and "Frankish" (or Roman Catholic) merchant districts. The above is a back street in the Varosha district. This is a street in back of that one. 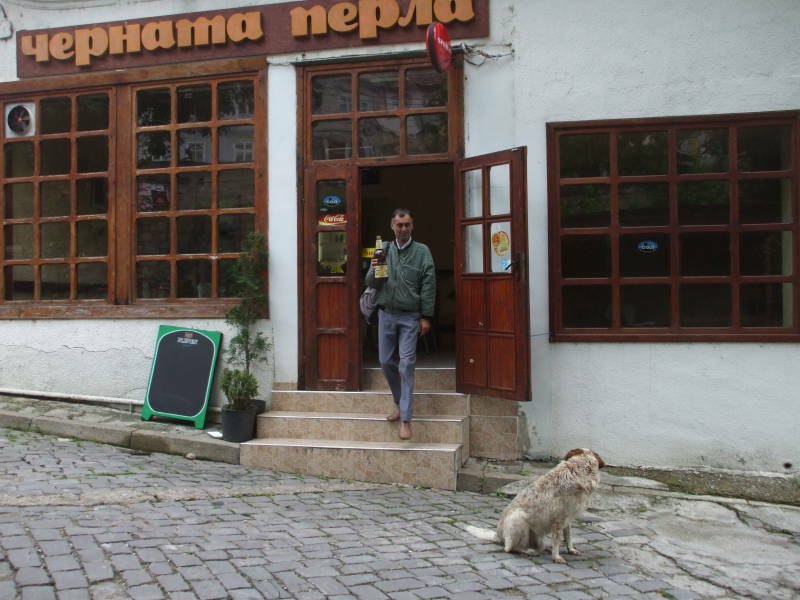 There are several very good restaurants along ulitsa Stefan Stambolov, the main street through Veliko Tarnovo. 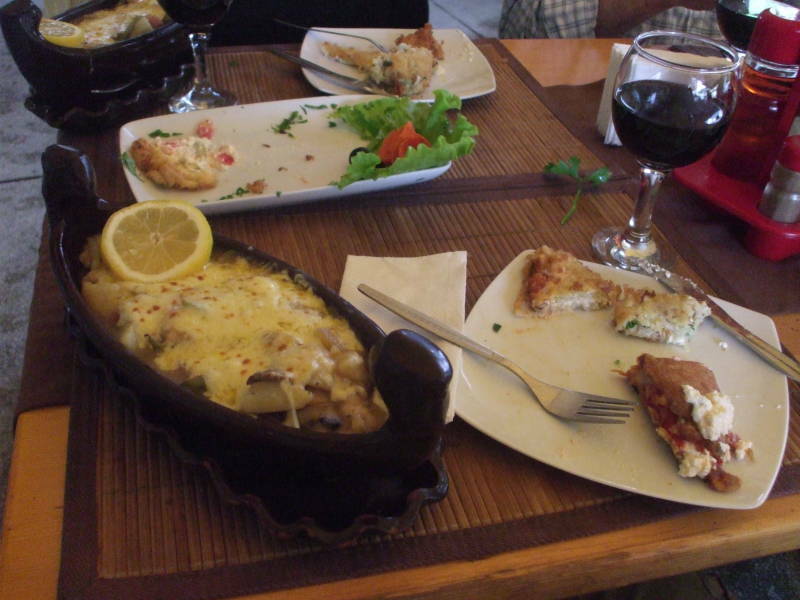 We are having some shared starters and salad, and they just brought our casserole main dishes baked in individual boat-shaped bowls. The wine is local, of course, as Bulgaria has been a source of wine since Thracian days. Two especially good vinarnati or wine bars and restaurants we liked were Mehana Balkan and Shtastlivetsa. That's Механа Балкан and Щастливеца, remember that Щ is pronounced as sht in Bulgarian and not shch as in Russian, Ukrainian, etc. Small shops can provide snacks and drinks. Or you can join the locals for a beverage in a neighborhood place like the Little Black Pearl. We stayed at Hostel Mostel. Yes, that's my mom outside the entry. They have very nice private rooms in addition to shared ones. 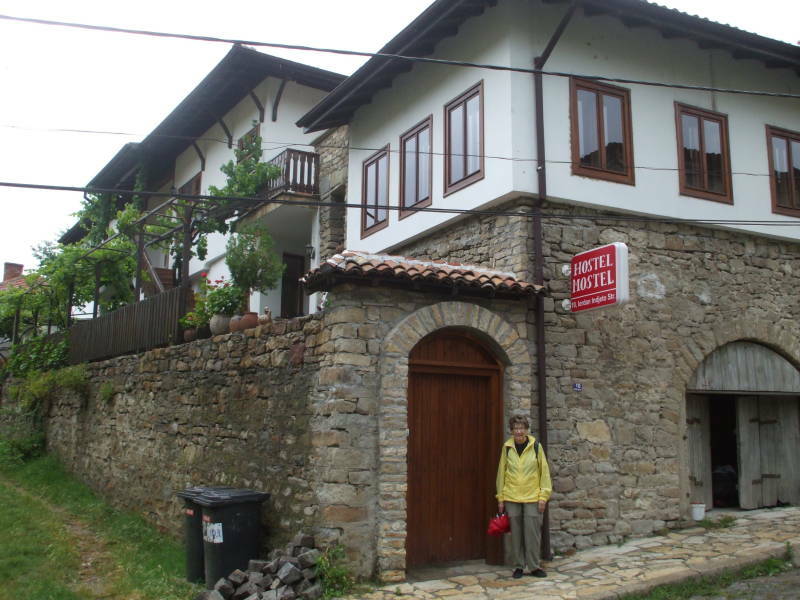 It is inside a big completely renovated traditional house. 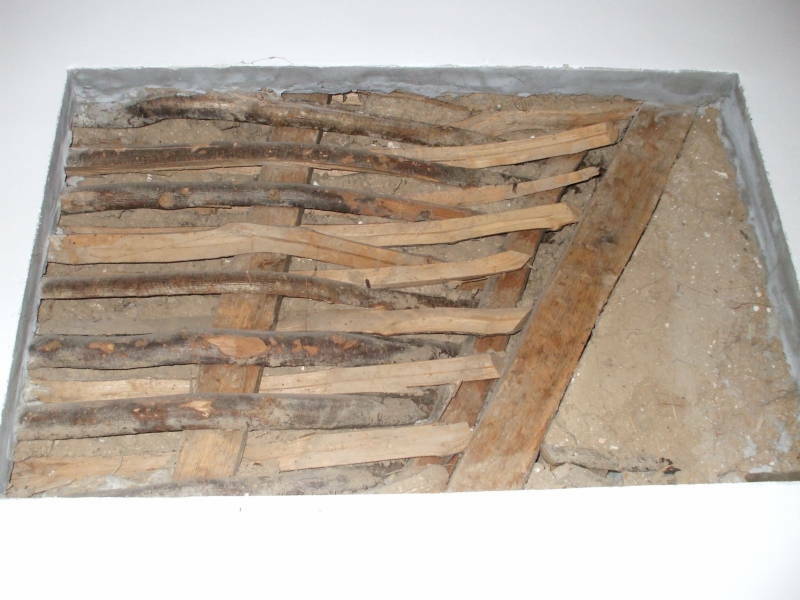 As an engineer, I like the way that some drywall has been omitted to show the traditional construction technology! The Bulgarian leader Tsar Boris I accepted Christianity in 865. By extension, so did the nation and people of Bulgaria. The immediate problem was that the Bulgarians were offered a Greek liturgy performed by a Byzantine clergy. This did not help the Bulgarian people and the cultural development of their state, as it would lead to the loss of the identity of the people and their nation. Tsar Boris I welcomed the missionary brothers Cyril and Methodius when they arrived in Bulgaria in 886. He tasked them with instructing Bulgarian clergy in the Slavonic language liturgy and the Glagolithic alphabet. The language, now called Old Church Slavonic, was based on the language spoken by the Macedonian Slavs in the area around Thessaloniki where the brothers had grown up. 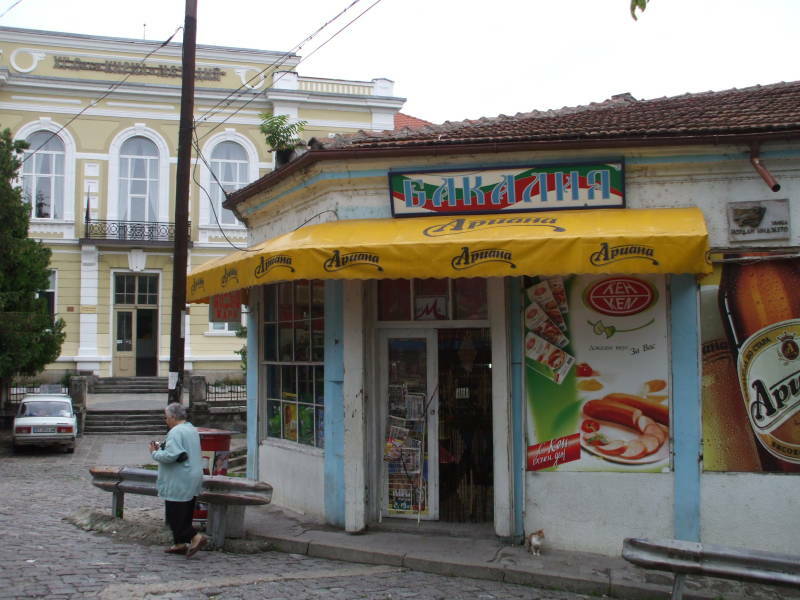 Now most linguists consider the Macedonian language to be just one end of the spectrum of Bulgarian, probably not different enough to be called even a dialect (although for political reasons many people insist that it is a distinct language). Tsar Boris I expelled the Greek clergy from his country in 893, issuing a decree that all remaining use of the Greek language liturgy be replaced by the vernacular Old Church Slavonic. In 919 AD the Bulgarian government declared that the autonomous Bulgarian Archbishopric was now autocephalous and elevated the Archbishopric to the rank of Patriarchate. In 927 the Patriarch of Constantinople agreed, recognizing the autocephalous Bulgarian Patriarchate and making it a member upgrading the Pentarchy of the original Patriarchates into a Hexarchy along with Constantinople, Rome, Alexandria, Jerusalem, and Antioch, and making the Bulgarian church the oldest autocephalous Slavic Orthodox church. The Bulgarian Orthodox Church considers itself to be "an inseparable member of the one, holy, synodal and apostolic church." In other words, in the Nicean Creed the word "catholic" is a non-capitalized adjective. 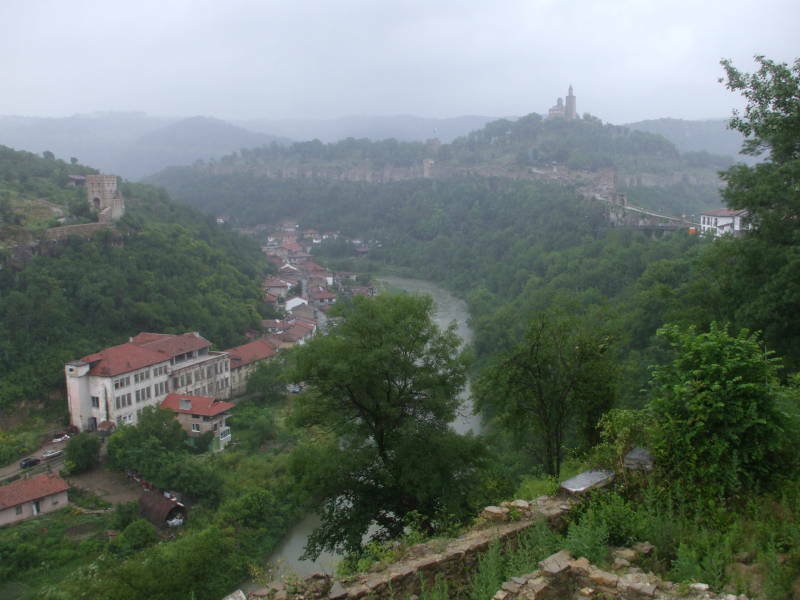 This picture shows the view from the Tsarevets fortress looking away from central Veliko Tarnovo toward the Asenova quarter along the river northeast of the city. There are a number of historically significant churches in this district. 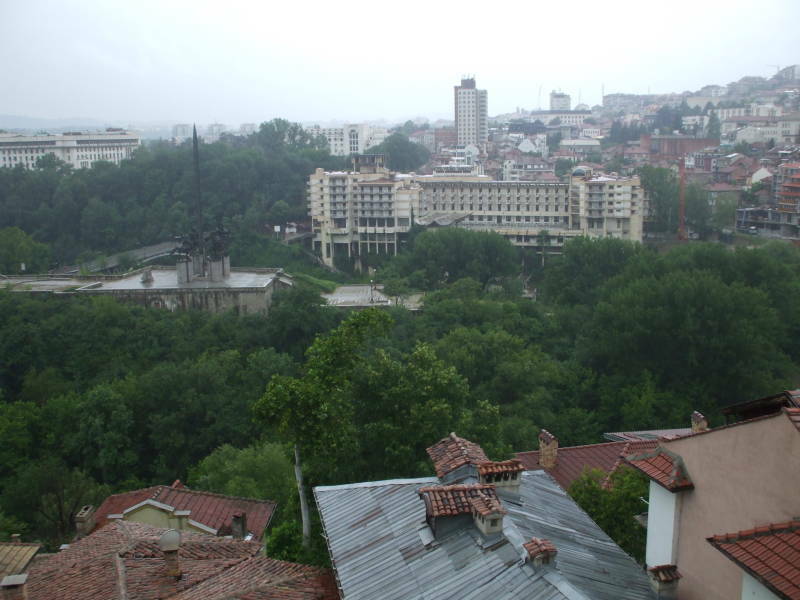 The most significant is at one end of that first bridge, the Forty Martyrs Church or църква "Свати Четиридесет Мъченици". This church holds some of the most significant historical records of the Bulgarian nation, and has been the site of significant events in the independence of Bulgaria. 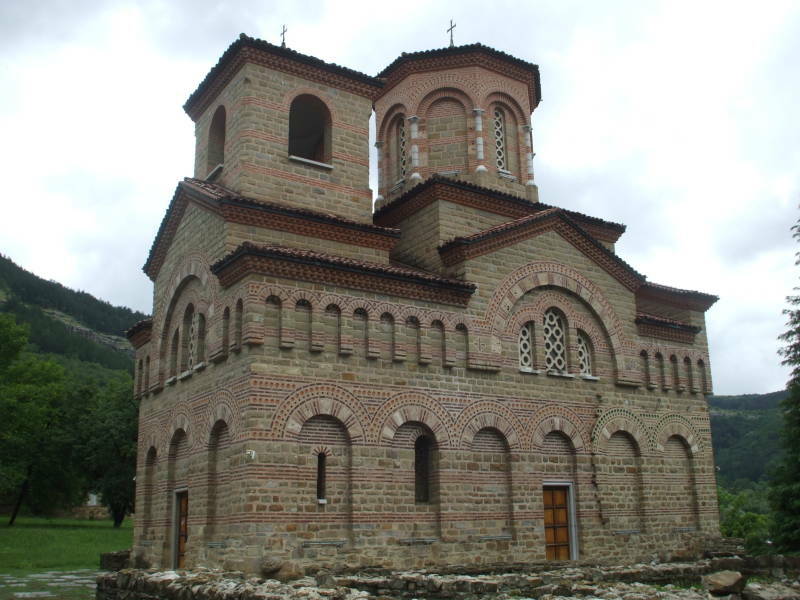 The church was built in 1230 on the order of Tsar Ivan Asen II in honor of his victory over the Despotate of Epirus near Klokotnitsa in March 1230. The Tsar placed a number of stone columns in the church. These stone columns had been inscribed by his predecessors and were legal records of the early Bulgarian state, going back to when Greater Bulgaria was ruled by the Khans. These columns include the Border Column of Rodosto from the 803-814 rule of Khan Krum, and Khan Omurtag's Column, which records an 815 AD treaty with the Byzantine Empire defining borders. 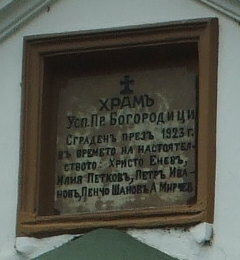 Tsar Ferdinand proclaimed the full independence of Bulgaria from the Ottoman Empire in this church on September 22nd, 1908. It still serves as the burial place for Bulgarian emperors and nobility. 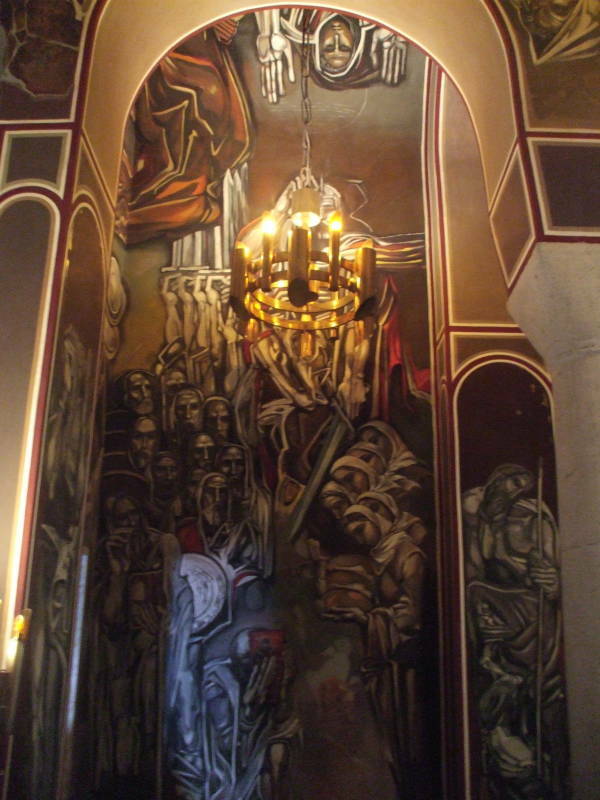 The church was dedicated to the Holy Forty Martyrs of Sebaste as the military victory had happened on their feast day. According to Bishop Basil of Caesarea (now Kayseri in central Turkey), who held that office 370-379, this was a group of forty Roman soldiers in the Legio XII Fulminata who had openly declared themselves to be Christians. In 320 they were condemned to death by the Roman prefect in Sebaste, in Lesser Armenia, now Sivas in east-central Turkey. They were to be exposed naked on a frozen pond on a bitterly cold night so that they would die of exposure. One of the soldiers left his companions for the nearby warm baths, at which point one of the guards carrying out the sentence saw a supernatural brilliant light, declared himself Christian on the spot, stripped naked and brought the total back up to a Biblically auspicious number of precisely forty. The frozen bodies of the thirty-nine soldiers plus one guard still showed some signs of life in the morning, so their bodies were burned and the ashes thrown into the river. This did not hinder a brisk trade in relics of the Forty Martyrs. 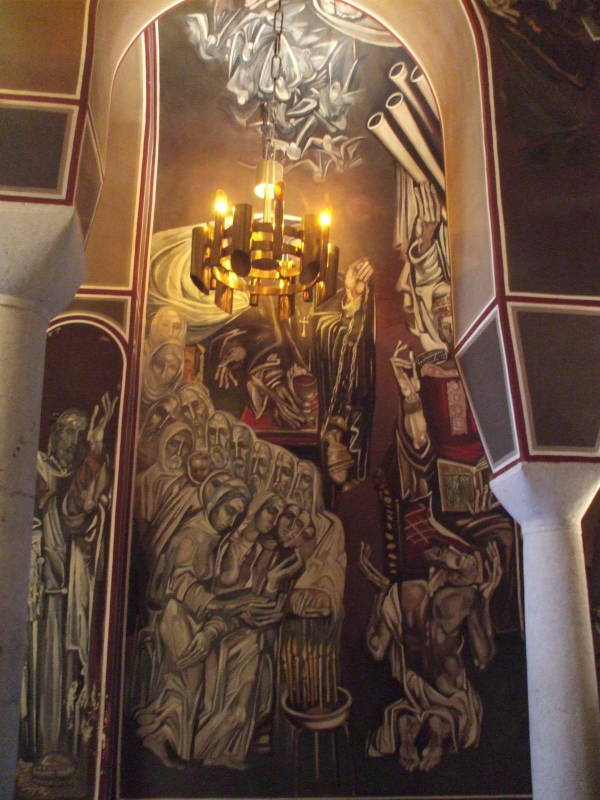 They became a popular recurring theme for Orthodox artists, who were always looking for gruesome martyrdom scenes for the narthexes of churches. Meanwhile, however, Bishop Basil had blamed the whole thing on the Roman Emperor Licinius I. He had been the rival (and brother-in-law) of Byzantine Emperor Constantine I, who had directed that the Byzantine thing to do was to portray Licinius as the villain whenever possible. For example, martyring these forty men through freezing followed by burning alive. Inconveniently for Constantine, and Basil, and people paying good denarii for those supposed relics, Licinius I was actually the co-author of the Edict of Milan that granted official toleration for Christians in the Roman Empire. Constantine eventually defeated Licinius at the Battle of Adrianople, and then had him executed. And then Constantine issued his own decree of tolerance of Christianity. Jumping forward to 1393 and the Ottoman conquest of Bulgaria, the Bulgarian leaders of the church were all executed and the Sultan subordinated the Bulgarian church to the Greek Patriarchy which was still based in Constantinople, which the Turks had not yet seized. As the Ottomans furthered their control, including conquering Constantinople in 1453, Bulgarian clerics were replaced to greater degrees by Greek ones. The Ottoman Sultan simplified matters for himself by regarding the Ecumenical Patriarch of the Greek Orthodox Church, in the city now known as İstanbul, as being responsible for all Orthodox Christians within the Empire whether they were ethnically Greek or not. This gave the Greeks enormous cultural advantages, as their Patriarch and his church hierarchy now also controlled the court and school systems throughout the Ottoman Empire. The Greek Orthodox priests, along with the local magnates, called the προτικοι or διμονγεροντες by the Greeks, or kocabasis by the Ottomans, became the effective rulers of the towns and cities throughout the Ottoman Empire. The προτικοι or protokoi were the bureaucrats and tax collectors, and they quickly gained a well-deserved reputation for corruption. Ottoman rule set up an essentially feudal system in which local administrators were to collect taxes and maintain a military establishment. Back in 1185, the former Second Bulgarian Empire had been controlled by the Byzantine Empire for the past 170 years or so. The brothers Asen and Peter were leading a revolt against Byzantine rule. Someone just happened to find a miraculous icon of Saint Demetrius of Thessaloniki. That's the Greek city of Thessaloniki, down south in Byzantine territory. The brothers declared that obviously Saint Demetrius, a warrior saint, had abandoned Greek Thessaloniki and taken the side of Bulgaria in the struggle. As implausible as this sounds, the brothers knew what they were doing as the discovery of the icon had a huge psychological impact on the population. The icon was found in the summer of 1185. From autumn of 1185 through the spring of 1186, almost all of northern Bulgaria was liberated from Byzantine control. 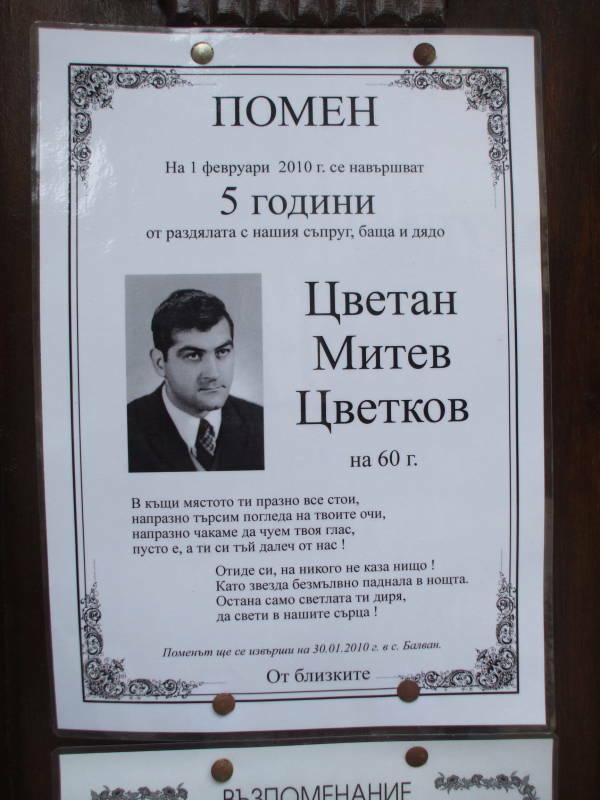 Funeral notice at the Church of the Assumption in the Asenova quarter. The Church of Saint Demetrius of Thessaloniki was once part of a large monastery built where Asen and Peter announced their anti-Byzantine icon-powered uprising that led to the re-establishment of the Bulgarian Empire with Tarnovo as its capital. The church was destroyed in the second half of the 13th century, probably by an earthquake, and reconstructed in the 1350s. 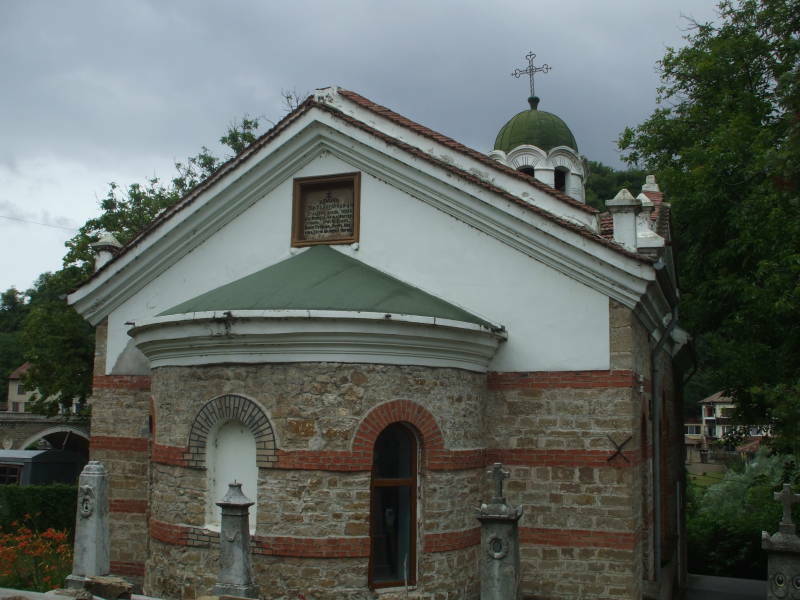 In the late 18th and early 19th century, toward the end of Ottoman control of Bulgaria, the church was plundered by robbers. 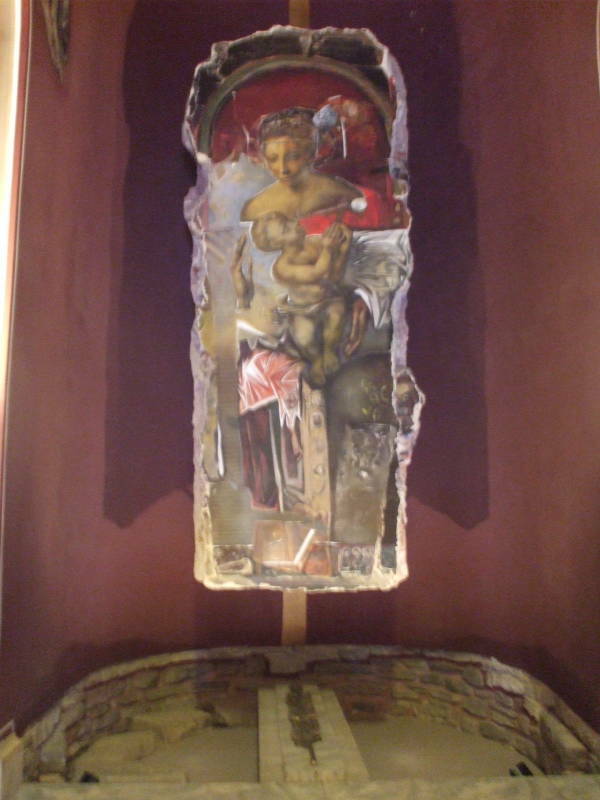 Then in 1913 it was destroyed by an earthquake that left only the apse and fragments of the original frescoes. It was reconstructed in 1977-1985. 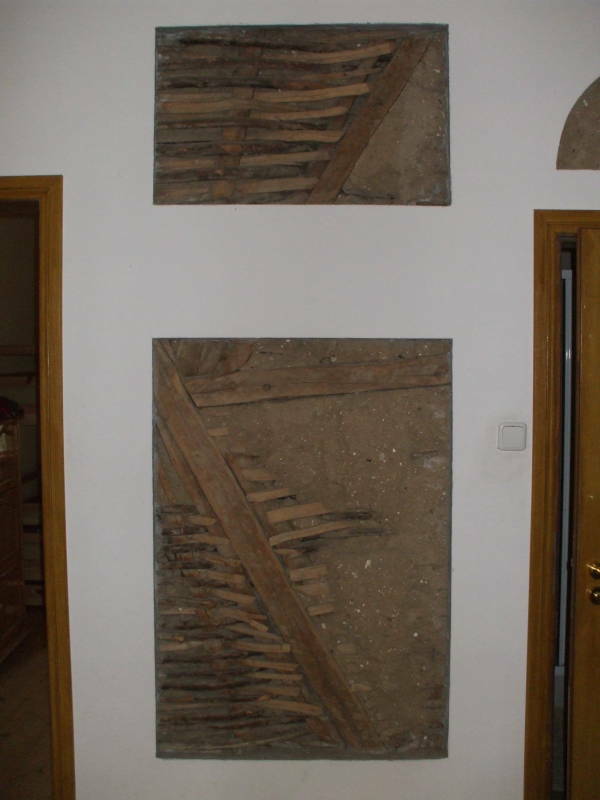 Two layers of frescoes have been preserved. One is from either the original construction or the late 14th century, the later one was painted some time after the 14th century.